During the Christmas holidays, I got to go to Tenerife for a week. I haven't experienced Christmas abroad that I can fully remember as I was in America for Christmas when I was 6. It didn't really feel like Christmas when I was there but it was lovely to not be absolutely freezing for a week in December. This was also my first excursion with my camera that I got for Christmas. We arrived to the hotel at around 8 o'clock. After getting a reception car to pick us up at the bottom of the steep hill, I'm glad we didn't have to haul our bags up, it was hard enough walking up by yourself. It was warm for compared to what it was like in Ireland. The first day should really be called 'The Feast of Rice Krispies and Manderins' as that was what we had for dinner. We had arrived at a bad time when the restaurant was closing and so was the shop. It was a bit of a disaster but the manderins tasted AMAZING, so it wasn't really that bad. This was the sight from my bedroom on the first day and something I didn't really want to see. Thankfully the rain and horrible gusts of winds only lasted an hour or two. We eventually got enough courage to venture down into the town of Costa Adeje. It is a smallish tourist town, we wandered around to try to figure out what we would do for the week. No one decided to do this before had. One of the things I hated about going into Costa Adeje was everyone is trying to make money from you. There was an incident when a man kept following us to try and get us to go into the restaurant he worked for, obviously we didn't and tried to avoid him for the rest of the week. In the afternoons we would always go back to the hotel and go to the pool. Of course, we got a taxi. One day it was so hard to get a taxi we decided to walk back to the hotel, it was exhausting and I wasn't the only one who hoped it would never happen again. The pool wasn't heated which made it interesting jumping from the jacuzzi into the main pool and getting the shock of your life. Christmas Eve and Christmas Day were spent at the beach. I don't really like swimming in the sea but my dad loves it. I spent my day just chilling, making sand castles with my brothers and walking along the sea. I can't remember the last time I was at a beach and not freezing cold. Christmas isn't really celebrated in Tenerife, since it's a slightly touristy nothing clothes. On Christmas Eve, one of the taxi drivers was wearing a Santa beard and hat which was highly amusing. To finish off Christmas Day, we watched Mrs. Browns Boy's on ITV which I was surprised there was even English channels in the first place. We went to Siam Park which is a water park. I am not really an adrenalin junkie and I hate anything that has a vertical drop as it makes me feel sick. There was plenty of things to choose from for a scaredy cat like myself like Mai Thai River, Jungle Snakes and my personal favourite Mekong Rapids. Of course, my brothers forced me on a few which I was happy to get off at the end. There was also a beach where there was a wave pool. Depending on how far out you were the waves could go up to 3 metres. It was so enjoyable trying to get onto the waves as they came. I unfortunately don't have any photos of Siam park as I was too afraid to bring my camera just in case it got lost. One of the last excursions we had was going on a half day trip up to the volcanic mountain Teide. The tour was very interesting talking about how this volcano formed Tenerife and about its more recent eruptions. This volcano is dormant which a lot of people were happy to hear as it hasn't erupted since 1909. The views were amazing and I have over 50 photos of just scenery and I found it so hard to narrow it down to the few here. This was definitely a new experience, I had never been on a sun holiday or been to such a touristy area. I enjoyed this holiday with my family but I feel that I mightn't go back to Tenerife for a couple of years as I didn't like how commercial it was. 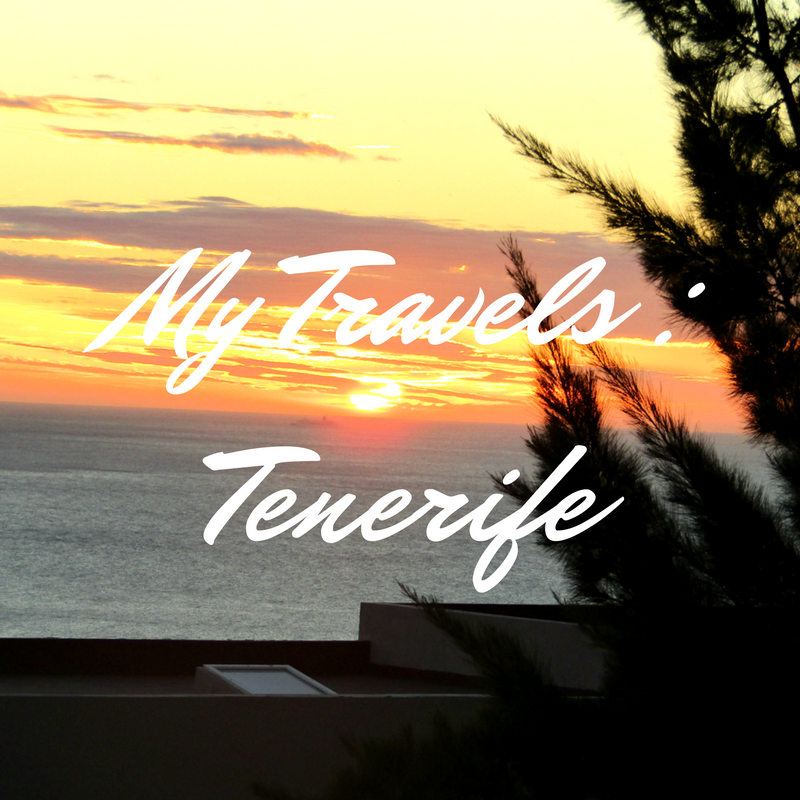 Have you been to Tenerife? What did you think of it? Wow it sounds like you had an amazing trip, Tenerife looks absolutely gorgeous !! Thanks for commenting Samara! I had a lovely time there, it is so picturesque. Thanks for commenting Laura! It was definitely a different experience. Looks absolutely fabulous. Although, I think it would be nicer in the summer. Pity about that incident with the guy and the restaurant though. I think I would have liked your last excursion talking about volcanos. It sounds very interesting! Thanks for commenting Ellen! I loved the volcano excursion it was so interesting and the views were lovely. Thanks for commenting Guilianna! I did have a lovely time and thanks I thought the shade was vv Summery so I had to wear it.